I am not a big fan of “chippers”, they remind me of a Chinese buffet, impresive in the offering but in the end not as satisfying as a good steak. With that said, you don’t have to like your medicine you just have to take it. Take # of pull ups and x2 subtract from time. We will be participating in the CF Lumberjack tribute to their members and others killed by the Ft. Hood terrorist. This is open to anyone interested, please come by 0900 on Saturday ready to show your determination. Think I’ll change my Gravatar to what I’ll look like after the WOD . . . . .
Oh Man, I didn’t even know the name of this workout and I lived up to it! This is the worse I have ever felt in a CF workout. Matt I am sorry you had to witness it. I hope to be back to my old self by Friday. Poor Casey, Is there a theme to your pictures on the 11-6 Wod he has you “talking” to the wall ball and today the “box whisperer”? Mine would probably be not trying to meet pukey:) See you Friday, I hope..Are we closed for snow?? Interesting workout. I look forward to learning/developing the Pistols. I need to work on balance w/my Rt leg. Left leg needs both balance & strength development. Max # ring rows in place of pull ups. Did 250m row and then 20 dips beween boxes, 30 reg sit ups, 20 thursters (10 lb), 20 assisted push ups, 20 box jumps, 15-20 TGU with a 10lb dumbell. Lost count several times during TGH. OMGosh, on the positive side I have set a new PR for TGH, now I will have to work more on dips. Liked the music Matt, ok, it was my music. Don’t hate the cascada. Next time Gloria Gaynor’s “I will survive”. Final time less ring rows-20:44. Casey……Were you selling buicks? ?, calling Ralph?? 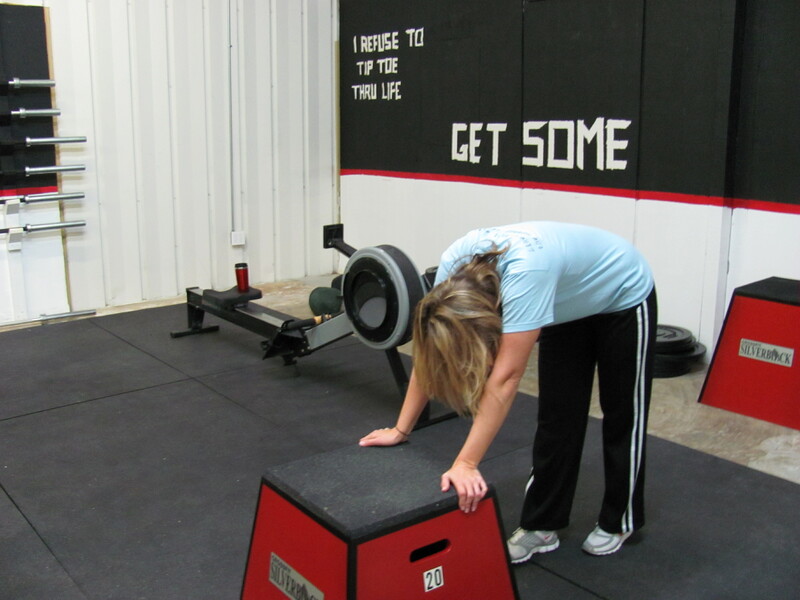 During or after this WOD? Dear Lord, it brought one of Crossfits finest down. I must try this..
Don’t Turks ride “yaks”? Appropriate. Casey, you must not have been feeling well. Don’t you normally box jump 24? If it makes it you feel any better, Christina almost yakked before we got started. Proud of her for making it through. Can’t say I appreciate the Turkish culture. Don’t worry about the pic Casey, we all have days like that. It just shows how dedicated you are!